Synesthesia is scientifically described as a cross-wiring, or lack of chemical inhibition, between brain neurons that occurs in about five percent of the population, often among “creatives”—musicians, artists, actors, writers, and so on. Scientific research is currently being conducted throughout the world to discover more about this condition. However, experts in the fields of spirituality and quantum physics are convinced that the truth of synesthesia lies not only within traditional science, but also within the realm of the mystical and the ineffable. Why survivors of near-death experiences sometimes “return” with this amazing gift. Why all infants are believed to be synesthetes until four months of age. The experiences of famous synesthetes such as Itzhak Perlman, Billy Joel, Pharrell Williams, and Marilyn Monroe (whose biographer, Norman Mailer, first asserted that she possessed this gift). 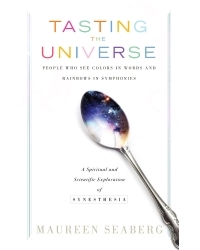 For Maureen, synesthesia is not an idle “brain tick” that can be explained away by science (although it does offer some important clues), but a unique and ineffable ability to tap into and reveal a greater creative universe and even the divine. Follow along with her as she takes you on her own personal “Eat, Pray, Love” of discovery, prompted by her often confounding yet always amazing experiences growing up with this gift. Maureen Seaberg has lectured on synesthesia and spirituality at the Towards a Science of Consciousness Conference at the University of Arizona-Tucson. She herself has higher and lower synesthesia, both concepts and forms appear to her in color (her k’s are teal and her 8’s are aubergine). A journalist for 20 years, Maureen has had articles featured in the New York Times, the Daily News, Irish America, ESPN the Magazine, and other publications. She has also covered breaking news for MSNBC and appeared on NBC, CNN, and PBS. Maureen earned a BA in journalism with a minor in Spanish from Penn State University, and a certificate of superior-level Spanish from the Universidad Complutense de Madrid.